Daughters of the American Revolution was founded in 1890 with the mission of promoting historic preservation, education and patriotism. It is a non-profit organization with over 185,000 members. 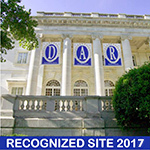 The DAR participates in many volunteer activities such as preservation of genealogical records, providing scholarships and awards to students, and supporting America’s military personnel, to name just a few. Not only will you benefit from contributing to these important service projects, but you also will meet other chapter members and make lifelong friendships! Interested in joining our chapter? If you are 18 years of age or older and can prove lineal, bloodline descent from an ancestor who aided in achieving American independence (military service, civil service, patriotic service), you are eligible to join the DAR. Contact us so we may help you prove your lineage, or if you would like to join us for a monthly meeting. Interested in joining the Daughters of the American Revolution? Joining is easy and we are here to help you prove your lineage to a patriot. Any woman 18 years or older who can prove lineal, bloodline descent from an ancestor who aided in achieving American independence is eligible to join the DAR. 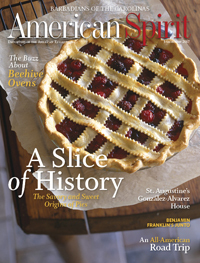 Interested in the American Spirit Magazine? Take a look!